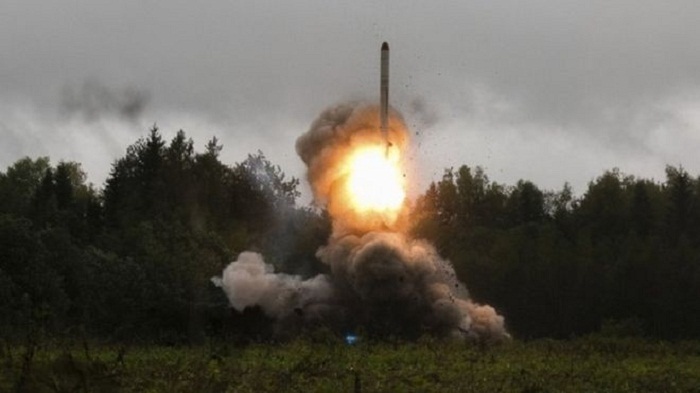 Western military alliance Nato has formally accused Russia of breaching the 1987 Intermediate-range Nuclear Forces (INF) Treaty, which banned land-based nuclear missiles in Europe. Following a meeting, Nato foreign ministers issued a statement supporting US accusations of Russian violations. The US has threatened to withdraw from the treaty because of Russian actions. Russia denied being in breach of the INF deal, saying it "strictly abides" by its conditions. The deal banned ground-launched medium-range missiles with a range of 500-5,500km (310-3,400 miles). "Allies have concluded that Russia has developed and fielded a missile system, the 9M729, which violates the INF Treaty and poses significant risks to Euro-Atlantic security," the Nato foreign ministers' statement reads. "We strongly support the finding of the United States that Russia is in material breach of its obligations under the INF Treaty. The new medium-range missile that the US - and now Nato - accuse Russian of deploying would enable Russia to launch a nuclear strike at Nato countries at very short notice. Speaking after the Nato statement was issued, US Secretary of State Mike Pompeo said Russia had 60 days to return to compliance with the treaty, after which time the US would suspend its own compliance. "During this 60 days we will still not test or produce or deploy any systems, and we'll see what happens during this 60-day period," he said. Russian foreign ministry spokeswoman Maria Zakharova was quoted by Interfax news agency as responding: "Russia strictly abides by the provisions of the [INF] treaty, and the American side knows this." The INF Treaty was a high-point for Cold War arms control in that it abolished a whole category of land-based missiles. But for several years now the US has been increasingly concerned at what it says are Russian efforts to breach the agreement. Russia, the Americans claim, has now deployed multiple battalions of new missiles threatening targets in Europe. And they have now decided enough is enough, giving Moscow a clear deadline of 60 days to come back into compliance or the US will itself cease to honour its terms. Nato allies here share Washington's concerns and have backed the US position, thankful perhaps that it includes this short grace period during which Russia might change its mind. But the chances of that are slim. And the fear is that the collapse of the INF agreement could help to unravel the whole system of arms control treaties, which have been so important in maintaining strategic stability. His administration's move to set up a missile shield in Europe alarmed the Kremlin, and was scrapped by the Obama administration in 2009. It was replaced by a modified defence system in 2016.